The thrust of the U.S. military’s laser weapon tests have focused on the sea, on land and aboard fixed-wing aircraft. You need a lot of power to generate a beam capable of burning through a target, which limits where you can stick a laser. But they can work on helicopters, too. 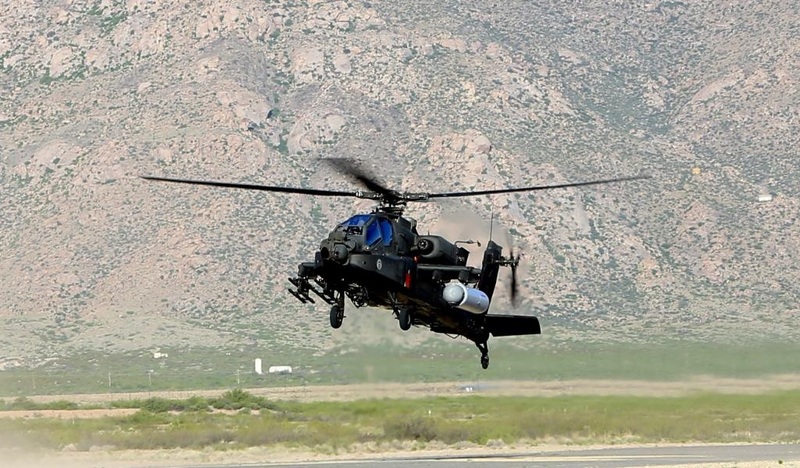 Raytheon recently tested a high-energy laser weapon attached to an AH-64 Apache helicopter gunship. Raytheon claims it’s the first time a “fully integrated” laser weapon system—specifically, integrated with Raytheon’s Multi-Spectral Targeting System sensor in this case—has been successfully tested from a helicopter “over a wide variety of flight regimes, altitudes and air speeds,” the company announced in a statement. The test, which involved U.S. Special Operations Command, took place at White Sands Missile Range, New Mexico. The idea behind the experiment was to see how well the laser performed against several unspecified targets. And in doing so, the company and SOCOM can study how the laser handled the Apache’s constant vibration, along with the downwash caused by the helicopter’s rotor blades in White Sands’ dusty, desert environment. A picture released by Raytheon shows the laser’s distinctive, greyish-white pod mounted beneath the Apache’s stubby left wing pylon. The device “achieved all primary and secondary goals” and “performed as expected,” the company stated. The U.S. Army’s Apache, in service since 1986, comes brimming with weapons including a 30-millimeter gun, 70-millimeter rockets and tank-busting AGM-114 Hellfire missiles. These weapons can become overkill, however, depending on the target. If an Apache needs to take out a generator that provides electrical power to an enemy command post, a laser might be a more efficient method than a $115,000 Hellfire. Same goes for knocking out a radio tower or a light vehicle. The advantages are not just in terms of cost. The laser beam strikes at the speed of light and can be perfectly accurate from miles away—provided the swiveling cannon can compensate for the helicopter’s movement. Now, a laser-armed AH-64 Apache might go on to strike aerial targets, too. In 2015, Boeing proposed a two-kilowatt laser weapon with a penny-diameter beam designed to burn drones to a crisp. The company also floated the idea of adding the laser cannon to the Apache. This comes as the U.S. Air Force is shooting Iranian-made drones out of the sky over Syria with F-15 fighter jets. Regardless, operational laser-armed Apaches are still likely a ways off, and the White Sands demonstration is still an experiment. We’re more likely to see lasers aboard ships—in fact, there has been a 33-kilowatt XN-1 LaWS installed on the amphibious transport dock USS Ponce since 2014. That’s a relatively small laser, as a warship’s power plants can generate considerable power and accommodate a weapon with double or triple the output of the XN-1. Even better for ships—don’t struggle with the same airflow issues that can degrade lasers beamed from aircraft. But laser weapons are practical, provided the Pentagon spends enough money developing and fielding them. And if that weren’t enough, the U.S. Air Force Special Operations Command is planning to install an experimental laser weapon on an AC-130 gunship. “It would be real nice someday, since we have the room on an AC-130, perhaps we should be looking at a microwave energy gun that makes people stop what they’re doing without having to kill them,” AFSOC’s Lt. Gen. Bradley Heithold said.